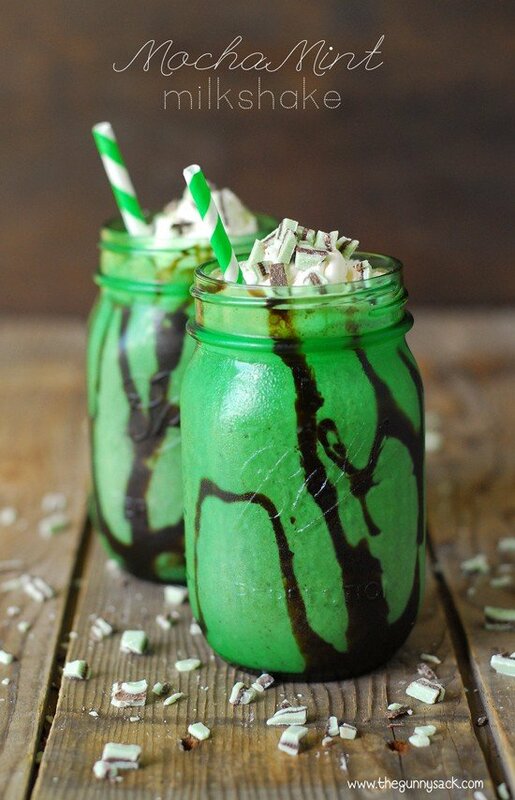 Chocolate and mint is one of our favorite combinations. We had a couple of chocolate mint desserts at our wedding. There were some leftover chocolate mints, so we brought them along on our honeymoon. We drove to the Carolina beaches and ate chocolate mints along the way. So many good memories and the combination of chocolate and mint always brings me back to that time. I wanted to try a new recipe with chocolate and mint. I decided to make halfway bars. 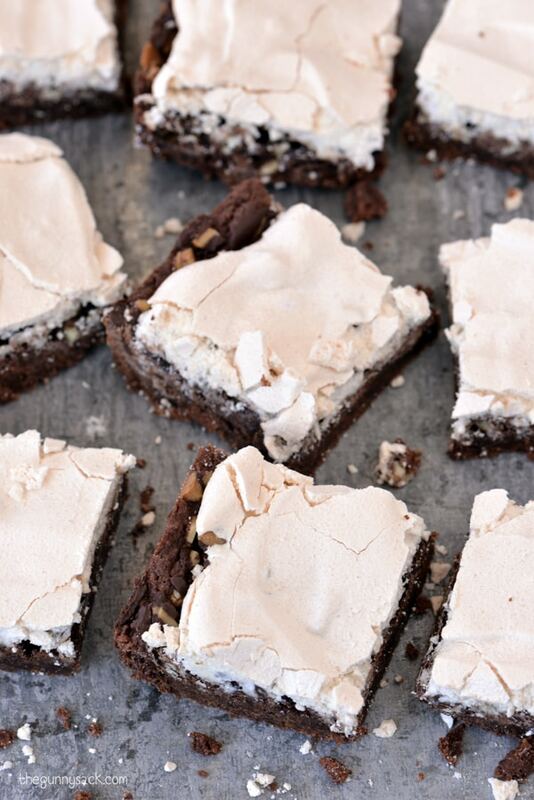 These Chocolate Mint Halfway Bars have a chocolate brownie bottom, a crispy meringue top and chocolate mint halfway between the two! For the bottom layer, mix together 2 egg yolks with 1 teaspoon of water. 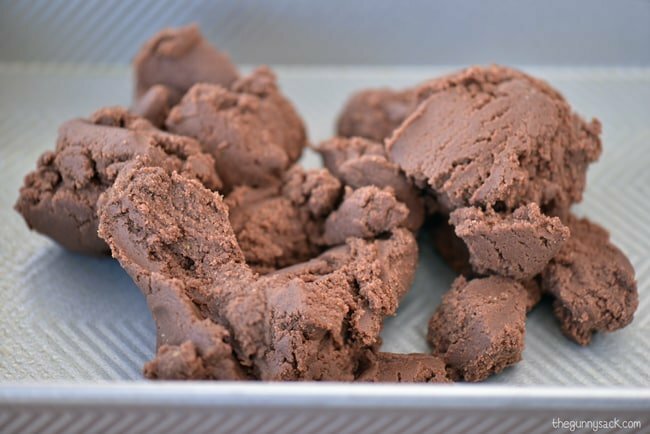 Then, mix together butter, granulated sugar, egg yolks, baking soda, flour, unsweetened cocoa powder and vanilla. Press the dough into a greased 9×13 inch pan. Beat egg whites until soft peaks form. Add the sugar and then beat until stiff peaks form. 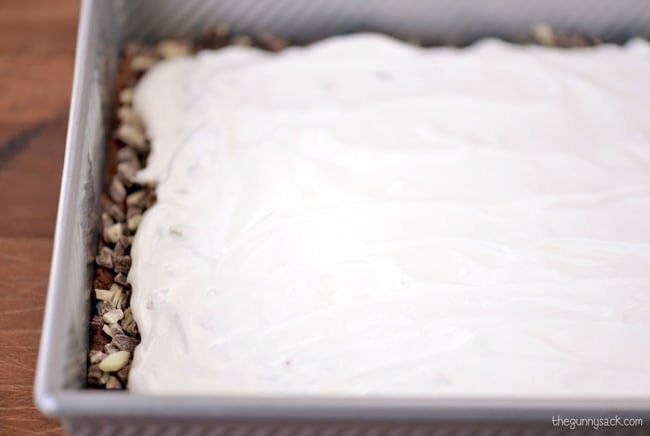 Carefully spread the meringue over the chocolate mint layer without allowing it to touch the sides of the pan. To make this step easier, I spooned the meringue into the pan in several dollops and then spread each of them out. Bake at 325 degrees for 25-30 minutes. Allow the bars to cool and then carefully cut them into bars. 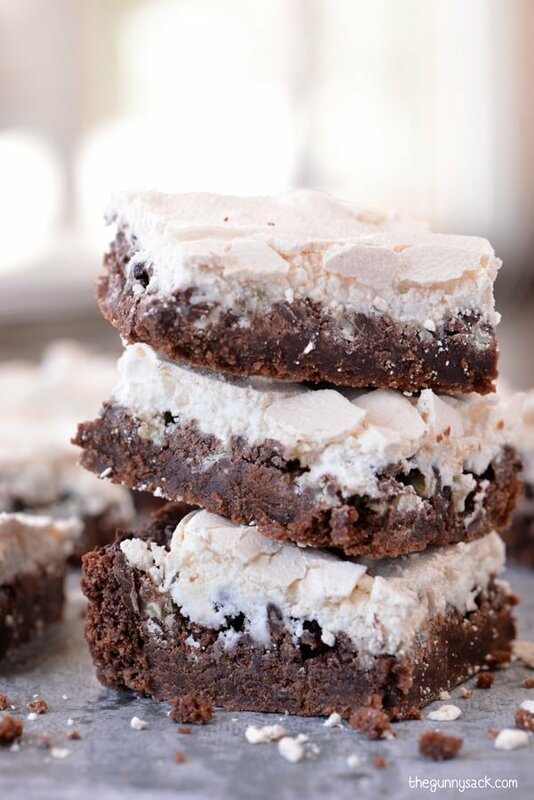 There is something irresistible about the crispy, melt-in-your mouth meringue on top of the rich chocolate brownies in these Chocolate Mint Halfway Bars. Mix together 2 egg yolks with 1 teaspoon of cold water. Mix together shortening, granulated sugar, egg yolks, baking soda, flour, cocoa powder and vanilla. Press the dough into the greased 9×13 inch pan. Sprinkle with chocolate mint baking chips. Add the granulated sugar and beat until stiff peaks form. 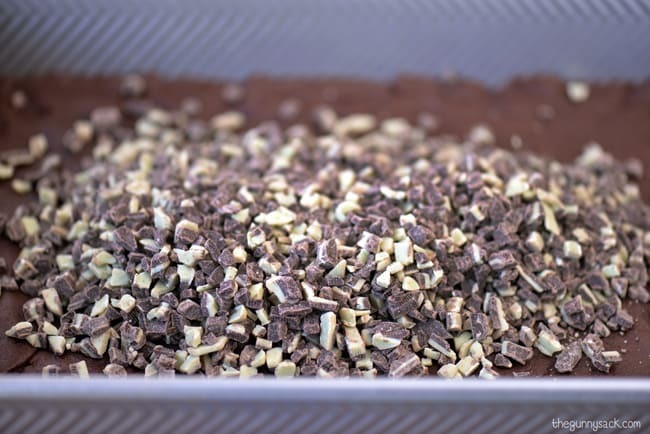 Carefully spread the meringue over the chocolate mint chip layer without allowing it to touch the sides of the pan. To make this step easier, I spooned the meringue into the pan in several dollops and then spread each of them out. 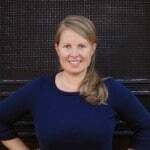 Sorry to ask, did I miss something… but the bottom layer looks like chocolate? no cocoa…? Oh dear! Nope you didn’t but I did! Thanks for the heads up! YUM!! 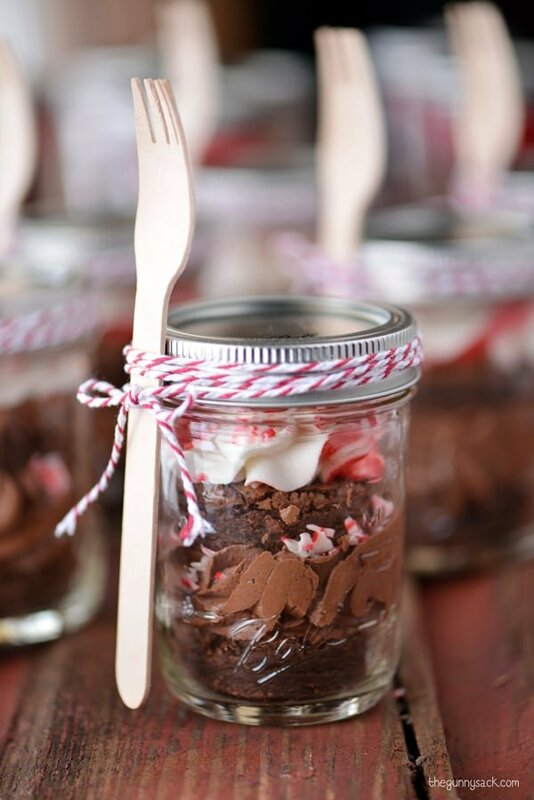 I”m pinning this…can’t wait to try! 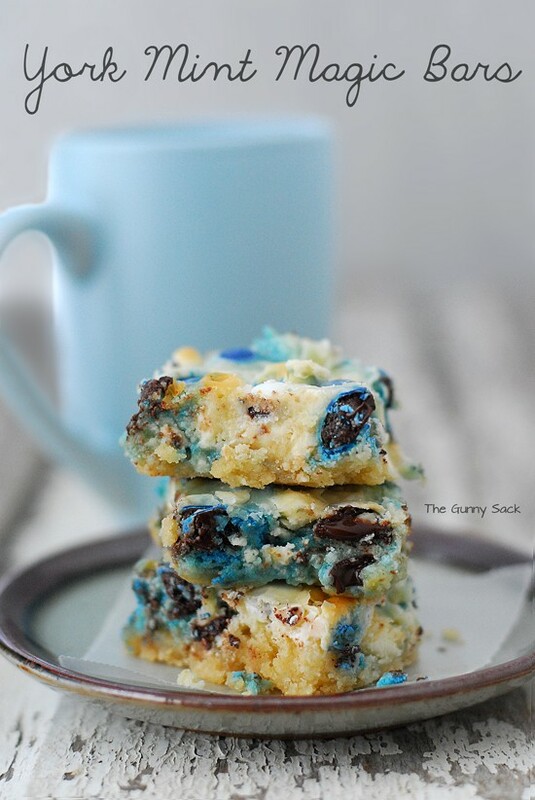 Can I have these for breakfast, pretty please?! 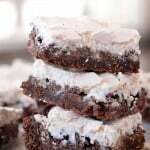 The chocolate mint bar itself is enough to make me swoon, and then you went and added meringue – WANT! These look so good! I love that layer of minty goodness! Oh my goodness. These look AWESOME! I’ve never made anything like this, but they sure do look amazing! Pinned! What a genius recipe! Like a mud hen but with white sugar. LOVE!